Photonic integrated circuits (PICs) provide a compact and stable platform for quantum photonics. 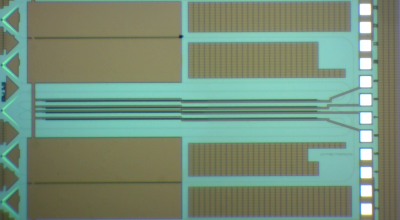 Here we demonstrate a silicon photonics quantum key distribution (QKD) transmitter in the first high-speed polarization-based QKD field tests. The systems reach composable secret key rates of 950 kbps in a local test (on a 103.6-m fiber with a total emulated loss of 9.2 dB) and 106 kbps in an intercity metropolitan test (on a 43-km fiber with 16.4 dB loss). Our results represent the highest secret key generation rate for polarization-based QKD experiments at a standard telecom wavelength and demonstrate PICs as a promising, scalable resource for future formation of metropolitan quantum-secure communications networks.